Before going further, let us take a look at the remarkable microorganism Zhang et al. performed their study on. Dictyostelium discoideum, the slime mold, is an amoeba, member of a heterogenous group of single-celled microbes united by the lack of a fixed body shape. Most of you would have observed amoebae in your high school biology class, or must have seen them in pictures (or if you watched Cartoon Network in the 90s, you might remember the amoeba boys from The Powerpuff Girls). Amoeba can create pseudopodia – false feet – that they can use to engulf their prey whole before digesting it. Dictyostelium, however, is a different kind of amoeba. When food (which for Dicty, consists primarily of bacteria) is available in plenty, Dictyostelium behaves like any other amoeba, happily swallowing prey as it moves through the soil. However, when food becomes scarce, this little microbe undergoes a fascinating transformation. 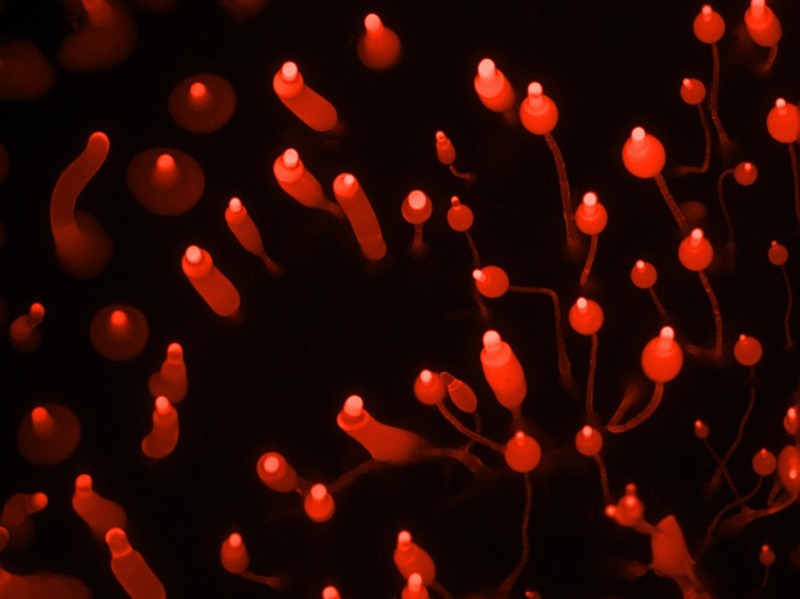 Hundreds, and often thousands of Dictyostelium cells come together to form a single body, called a slug (named so both because of their shape and the slime trails they leave behind). Slugs can contain up to 100,000 individual Dictyostelium cells, are 1-2mm in length, which means they can be seen with the naked eye, and can move as a single body towards stimuli like light or nutrients. The slug travels for days, and once it reaches a suitable environment, it forms a mushroom-like fruiting body, with a stalk and a spore head, which then releases thousands of spores into the environment. The spores germinate to give rise to brand new mature and independent Dictyostelium cells. In doing so, Dictyostelium, like other slime molds, occupies a unique boundary region between unicellular and multicellular organisms. Here’s a video of Dictyostelium in action. Dictyostelium can be grown in the lab on agar plates with lawns of bacteria to serve as food. Depleting the medium of nutrients causes individual amoeba to aggregate and form slugs, which can be studied as they are, or disaggregated to look at individual cells. Zhang and colleagues observed that as the slug moved through an area containing the pathogenic bacteria Klebsiella pneumoniae, it released a cloud of DNA into the surroundings. This DNA could be stained and visualized by a dye called propidium iodide. When the researchers took the slug apart, they found that the extracellular DNA is released almost exclusively by a class of cells called sentinel cells (S-cells). Sentinel cells have previously been shown to act as specialized immune cells for the Dictyostelium slug, capable of phagocytosing (swallowing) and killing bacteria in the slug’s immediate surroundings. The scientists confirmed that the extracellular material was DNA by adding a special enzyme that digests and degrades DNA to the medium, and observing that the stained cloud does, indeed, disappear. The scientists’ next experiments revealed the unique function of this strange extracellular net. When the researchers added tiny bacteria-sized beads to the medium around the Dictyostelium slug cells, they quickly became trapped and concentrated at the areas with the nets, showing that these nets can effectively trap particles of a similar size. At the same time, when these nets were formed in a bacterial lawn, the bacteria in the vicinity could be seen to die. When an enzyme that could degrade DNA was added to the medium along with the net-forming cells, the bacteria could no longer be killed as effectively. 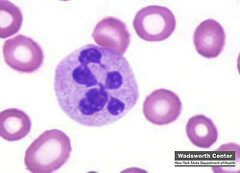 The process of extracellular trap formation by immune cells like neutrophils is called ETosis, and it is one of the early steps of programmed cell death, a kind of altruistic suicide that these cells undergo following an infection. You can also get a sense of this when you consider that the DNA that neutrophils extrude in order to form extracellular traps is made up primarily of nuclear DNA, which is kinda important for cells. However, in their experiment, Zhang and colleagues did not observe significant numbers of Dictyostelium Sentinel cells dying off as they produced extracellular traps. Upon testing, the nets were found to contain almost exclusively mitochondrial DNA, which is DNA contained in organelles called mitochondria (these are small compartments inside the cell that generate energy for the cell to function). Mitochondrial DNA is also important for the cell; however, it is much more numerous and definitely much more expendable than nuclear DNA. While Dictyostelium cells are also capable of apoptosis – the altruistic self-sacrifice for the greater good that we talked about earlier – this does not seem to be necessary for producing extracellular traps. Other aspects of the extracellular trap response seem to be remarkably conserved between Dictyostelium and multicellular organisms. Reactive oxygen species (ROS), which are oxygen-derived free radicals often used as a toxic antimicrobial substance by immune cells, was shown to be produced by the Dictyostelium Sentinel cells, and reducing ROS levels by a ROS ‘scavenger’, significantly improved bacterial survival. In mammals, toll-like receptors are a type of protein that sense and recognize foreign bacterial particles. The homolog of such genes in Dictyostelium, TirA, appeared be critical for the production of extracellular DNA traps, and Dictyostelium mutants lacking it were much more susceptible to bacterial infection in later stages of their life cycles. Amoeba diverged from other animals approximately 1 billion years ago. Since then the two lineages have evolved separately, though often in the same environments, with the latter following the path of greater complexity and going on to create multicellular creatures as large as the blue whale, while the former remained restricted to the scale of a few micrometers (sometimes millimeters). Yet, as this study shows, the mechanisms of host defense against parasites possibly predate even this ancient divergence, and continue to help both us and Dictyostelium in our lifelong struggles for existence. This is a really fascinating subject and article. My one complaint is with your choice of metaphors. You speak throughout of evolution as an arms race, and while I don’t think that this is a wholly inaccurate description, it is a politically and culturally loaded one that reinforces certain ways of thinking about life and interactions between species. If you read Margulis or Haraway you can see other ways of describing the competition and cooperation of life that do not rely on metaphors of war. They speak of an interlocking dance of infolding, consumption, and symbiogenesis, highlighting the primacy of cooperation and communication in the formation of all complex life. I think that science journalism requires careful consideration of the cultural narratives we reinforce when we look at and describe the world around us. It always makes me a little sad to see us projecting human notions of violence and aggression onto the microbial world. 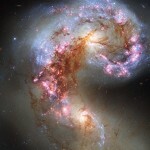 Surely we can find other ways of considering the dance of life at such a different scale from ours. Thanks for your comment, Reed :). However, I always tend to think of the natural world as just as violent as the human one – in fact, humans evolved as part of the natural world, and I cannot think of violence and war as merely cultural constructs. I agree with you that the metaphor tends to ascribe a form of agency to these wonderful creatures that they likely lack, yet aggression is a clearly present influencer of survival, and hence evolution, in all these life forms. Thanks for the recommendations, by the way – those are two authors I really need to check out.